1850 Original Illustrated Antique Map of "CAPE COLONY" by Tallis (63d). Drawn & engraved by John Rapkin for "The Illustrated Atlas and Modern History of the World" by Martin Montgomery. 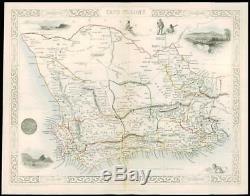 N attractive and decorative map of CAPE COLONY with vignette engravings of CAPE TOWN, GRAHAM'S TOWN & ENTRANCE TO THE KNYSNA. An excellent example of the preferred Montgomery Martin edition. Generally fine condition with the usual central fold. Approx 360mm x 280mm and printed on heavy grade paper. Perfect for mounting & framing. John Tallis is considered to be one of the most renowned cartographers and publisher of the C19th. His maps are considered to be the last of the lavishly decorated and ornamental maps, works of art as much of geography. He was born in Stourbridge in Worcestershire in about 1818 and it is possible he stayed working in the Midlands working as a publisher in Birmingham, until he moved to London in the early 1840s. John then set up the first of his publishing businesses, in Cripplegate, with Frederick Tallis, who was quite possibly his brother. This business lasted from 1842 to 1849 when it was dissolved. By 1846 the business had moved to Smithfield. From 1851 54, John set up another business, operating as John Tallis and Company and it was during this period that he produced the Illustrated World Atlas, produced for the 1851 Great Exhibition. The intriguing thing is, that at some point, John Tallis made the acquaintance of an engraver called John Rapkin who was an inspiration to Tallis. His stunning illustrations enabled the maps they produced to be beautiful illumanitive works of art. John Rapkins work inspired John Tallis and they used travelogues extensively to guide Joh Rapkin as he produced vignettes and ornamental engravings to embelish the Tallis maps. All our items are original Antiques and as described. Our terms of sale are clearly displayed with every listing. We are always looking for Prints (mainly 1500 - 1800's), Maps, Atlases, Old Documents, Letters, Postal History, Correspondences, Archives, Posters, Ephemera, Stamps, Antiquarian Illustrated Books (up to late 1800's especially the Illustrated London News, The Graphic etc), runs of Periodicals, Postcards - in fact anything that can be considered to be antique, as long as it is in some kind of paper form! We have also worked closely with Libraries, Solicitors, Estates etc to advise on the most appropriate method of disposal for Archives and Private Collections and have provided a Private Treaty Service for many clients in order to maximise the best possible return, with complete discretion. All items we well are guaranteed to be as described and original antiques. Get Images that Make Supersized Seem Small. Tailor your auctions with Auctiva's. The item "1850 Original Illustrated Antique Map of CAPE COLONY by Tallis (63d)" is in sale since Thursday, September 13, 2018. This item is in the category "Antiques\Maps, Atlases & Globes\Africa Maps". The seller is "antiquepapercompany" and is located in KENT. This item can be shipped worldwide.